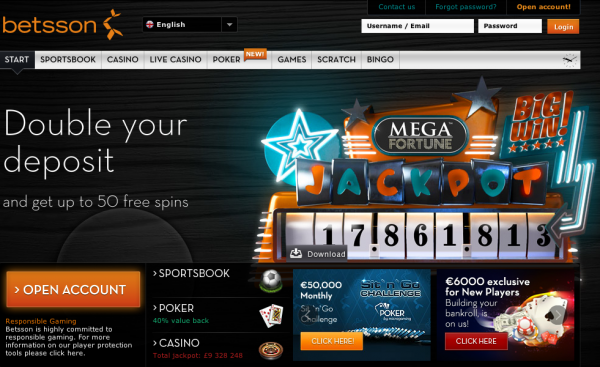 There are a number of reasons why you may be looking for a new online casino at which to spend your hard-earned money; perhaps you’ve had a bad experience at your usual website, maybe you’re after some new bonuses or maybe the range of slots has become a little tired. For slots players it is of course important to select a new casino which can offer you a large range of games; it also helps to find a venue which regularly adds new games to the mix and of course one which features your favourite software developers . Betsson is one of our recommended casinos and one which ticks all of the above boxes; joining as a new player will of course rewards the new player with some great welcome bonuses but the number and range of slots available are the main draw. We’re big fans of Net Entertainment releases and those games form the backbone of what’s on offer here but Betsson also seem to pick up some of the best games from other developers. These include WMS Gaming and Play N Go but unlike some websites you can’t sign in and expect to find every one of WMS Gaming’s slots. The games are all available under the ‘Casino’ tab on the menu at the top of the screen and once you’re at the next screen you can use the menu on the left to select the type of game you want to play. There’s also a search box to the right of the screen which will take you straight where you want to go – as long as you know the game’s title. The games are ordered so that the newer slots are at the top of the screen but you can rearrange this into alphabetical order by clicking the A – Z tab near the top. You may wonder why this is necessary but if you’re as pedantic about the slots you’ve already played as we are, it aids in the search for the next unplayed one to check out. As a last word, Betsson often seems to hand out free spins to it’s customers to celebrate various occasions so that’s why it remains one of our favourites.